WE ALL KNOW the type. That lot that keep their festival wristbands on months, if not years, after they’ve actually been to the festival. Just in case you didn’t know they went. Well, it might be time to cut them off. A study has found that that little strip of cloth could be harbouring all sorts of nasty bacteria. Microbiology professor Dr Alison Cottell found that the fabric wristbands are a playground for bacteria, and can contain 20 times more than clothes. But don’t go ripping them off in disgust just it yet, the study was done by testing just two bands which a festival-goer had been wearing since 2013. Cottell found the bands contained staphylococci and micrococci bacteria, which she explains are often found on the skin, but not at such a high concentration. Staphylococci are usually harmless although they can cause boils and infections of cuts and grazes, and can also cause a form of acute food poisoning if they are ingested. Infections are most likely to affect the ability of cuts and grazes to heal. More serious, but rare, complications include septicaemia. She went on to explain that this is obviously bad news for those who work in healthcare or with food, so advises them to remove all bands. If not for the bacteria, do it for your own sense of pride. People who still wear old festival music wristbands, why do you fear the future so? Good things WILL happen to you again. If you must keep them, store them somewhere well away from your general being. Email “Do you wear old festival wristbands? Science says you're manky”. 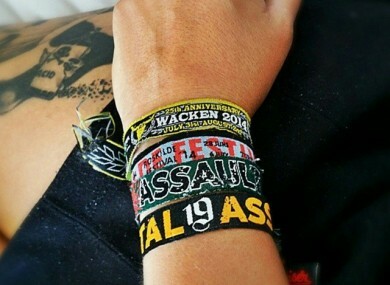 Feedback on “Do you wear old festival wristbands? Science says you're manky”.